There has been crafting today, including making Christmas cards whilst listening to Christmas songs. (Those who think the world is about end can relax - it was a one-off to raise somebody's spirits, normal humbug level has been restored). Aside from that, the outside of the book has been finished (I think). 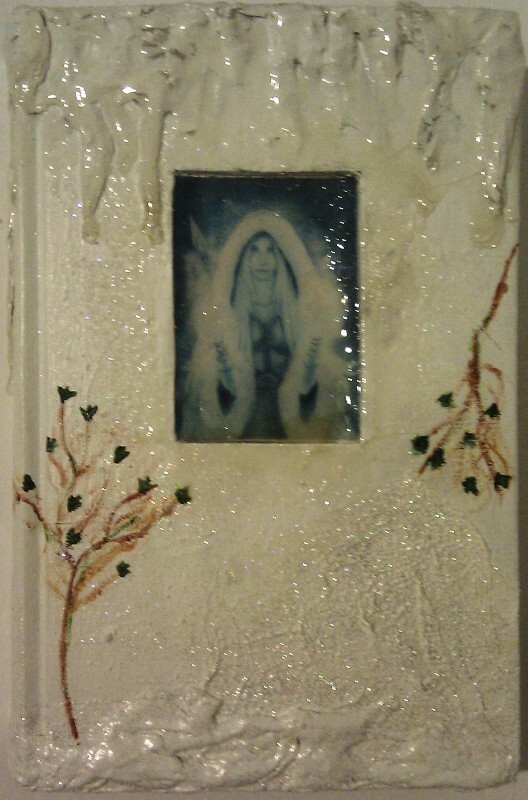 The cover now includes an image of Skaði, some winter ivy, and more ice. I'm not 100% sure about the focal piece - I may try and break up the straight edges a little. The inside is still blank, as I'm still looking for the right idea, but it will hopefully be done before the end of AEDM. 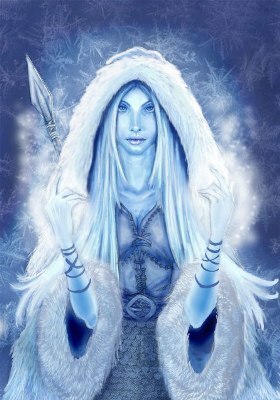 The image of Skaði is courtesy of Google. I had a better image, but it was copyright and I couldn't contact the original artist. This one appears to be PD as it crops up left, right and centre when Googling and there's no clue who first created it. It's a shame there's no originator info, as it's a fantastic image. Nice book cover.....had not heard of Skaði so just been off to google....interesting! I like how it is believably icy with the lovely Norse creature; renowned for Winter and mountains. Nice construction! You had me wondering who this beautiful being was too. How lovely! A great book cover too, Nigel. I tend to be a bit of humbug with Christmas...it's too commercialised nowadays. Although my kids like to play the Christmas songs and I do like to listen to the oldies. WOWEE Nigel I adore your book cover and am entranced by your Skaði image...I will be googling her to find out more! The shimmer is brilliant and magical too! I really like the icy sparkling effect and the image is awesome. Interesting work. Both concept and design flow together great.